You'll be £12.99 closer to your next £10.00 credit when you purchase Narrow Gauge Railway Stamps. What's this? This, the first of four books, looks at the treatment of varying aspects of public transport with the aid of postage stamps, either issued by the postal authorities of most of the world's nations, or some of the railway companies themselves, especially heritage operators. It has long intrigued the author as to why narrow gauge systems throughout the world have demanded a far greater attention from the public and stamp producers than railway subjects from the standard gauge lines, which make up the vast majority of the western worlds major railway systems. The conclusion he has reached is that in most cases they are considered cute a truly abominable term, which is (thankfully) gradually fading from our vocabulary, but just how the author felt on first seeing engines of the Talyllyn Railway, in mid-Wales, from the top of the station approach at Tywyns Wharf Station: tiny little kettles in sparkling, rich green and lots of brass. The Talyllyn has the double honour of being the world's first railway to be taken-over and operated by a preservation society in 1951, and also the first railway in the modern era to issue its own Railway Letter Service stamps, a practice that can be traced back to the very earliest of times, which allowed people in outlying areas to send letters by the railways to the nearest post office for onward transport. The Talyllyn's first stamps were issued in 1957, and today the lucky collector can demand a substantial premium on the paltry issue value. From whatever origin or country, there is a huge variety of stamps covering narrow gauge railways, and usually they are attractive miniature works of art that make them very collectable. The author has not set out to cover every country or issue in these books, but to present a wide selection of those stamps that are note-worthy. High quality drawings and layout, in addition to a great amount of information. The author's enthusiasm for narrow-gauge railways shines through this light, but informative book and takes us on a world tour of some of the hundreds of these on all the five continents. Philatelists and railway buffs will love Narrow Gauge Railway Stamps in which Howard Piltz cover the globe. Although Philatelists are its primary focus, readers interested in the more exotic permutations of ‘trains’, may also find it of interest, with even children perhaps getting pleasure from viewing Thomas’ relatives. Despite the images being stamp-centred, readers who just want ‘nice’ pictures of trains might also find it worthy of their attention. Artists with an interest in ‘Things railway’, might also find the volume a useful resource. 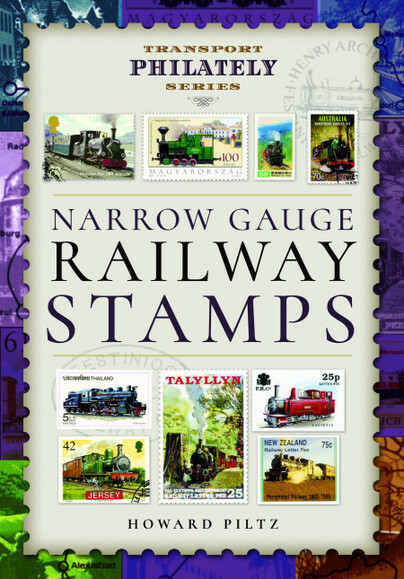 Wilmslow author Howard Piltz has written a fascinating new collectors book on narrow gauge railway stamps. Howard Piltz clearly knows his subject and has worked hard to dig out the various stamps, some of which are highly attractive and which are well illustrated in the quality colour illustrations. The book starts with UK stamps and in each chapter covers a separate continent, describing how the various postal authorities came to issue stamps. There is also advice on collecting in what is an interesting and novel title on an unusual subject. Howard Piltz has lived all his life in Cheshire and spent almost all his working life in public transport. He was awarded Chartered status of The Chartered Institute of Logistics and Transport in 2007. His enthusiasm for transport goes back to his days in short-pants and has encompassed buses, trams, railways as well as aviation. Philately has been an absorbing hobby for almost as long, gradually concentrating on transport subjects so the coming-together of the two in these books has come as a happy marriage.